The legendary home of the stars combines sun-kissed beaches with buzzy neighbourhoods, world-class culture and several of the planet’s most famous theme parks. L.A. is a collection of villages, each with their own unique character, and most visitors will find a Westside location – between downtown and the beach – the most convenient place for exploration. Public transport has greatly improved in recent years, linking downtown by fast and frequent bus with Hollywood, Beverly Hills, Westwood and the beach hubs of Venice and Santa Monica, while the Metro runs east to Pasadena and north to the entertainment hub of Universal City at lower prices than Londoners have to pay for Tube rides. Hollywood is unmissable for first-timers, who will want to see the handprints of the famous immortalised in cement outside Grauman’s Chinese Theater, the most famous of all the ornate picture palaces which were created during cinema’s golden age. Grauman’s is still a functioning cinema where it’s great to take in a new release, and equally unmissable is the Hollywood Bowl, where every kind of music is performed in a beautiful outdoor setting from June till October. To the north lies Universal Studios, offering a great day out enjoying movie-related rides as well as a unique tour past the Psycho house and other famous film locations. Major acts play at the Universal Amphitheatre and the Greek, perhaps the world’s most beautiful and intimate setting to watch a gig. LA’s most relaxed and buzzy shopping, dining and nightlife are centred on West Hollywood, which connects Hollywood proper with Beverly Hills. Here Melrose Avenue and Third Street, running parallel, are lined with boutiques, cafes and restaurants offering something a bit different from the norm. Joan’s on Third Street has the best breakfasts, while the city’s most interesting lunch offering is the delightfully retro Farmer’s Market at Third and Fairfax, an LA institution where you can pick a dish from stalls offering everything from Balinese to Brazilian, Cajun to BBQ specialities, and eat them at communal tables in a relaxed, sun-dappled setting. Sunset Strip, sitting on a hill at the northern end of West Hollywood, can’t be missed; rubberneck the huge billboards, have lunch or a sundowner at one of its outdoor cafes – try Le Petit Four – and enjoy the view over a million twinkling city lights as the sun goes down. Beverly Hills, where the stars spend their money, is a great place to while away an afternoon walking the beautiful streets around Rodeo Drive. There are plenty of places to take a load off between window-shopping the designer stores; Nate’n’Al’s on Beverly Drive is a haunt of filmland’s movers and shakers, and makes some of the town’s best deli sandwiches. From here it’s a half-hour ride to Santa Monica, the biggest of LA’s seaside resorts with good beaches, a lively pier and a plethora of bars, cafes and restaurants. The Border Grill offers great Mexican food in a sophisticated, colourful setting; its signature dishes can also be enjoyed at the twice-weekly outdoor farmers’ market, a great place to shop if you’re self-catering. While Santa Monica is a family favourite, singles and couples may prefer edgier Venice to the south. Here Main Street offers cutting-edge shops and funky cafes, while the main attraction is a wander through the canal system connecting some of the city’s most enviable homes. 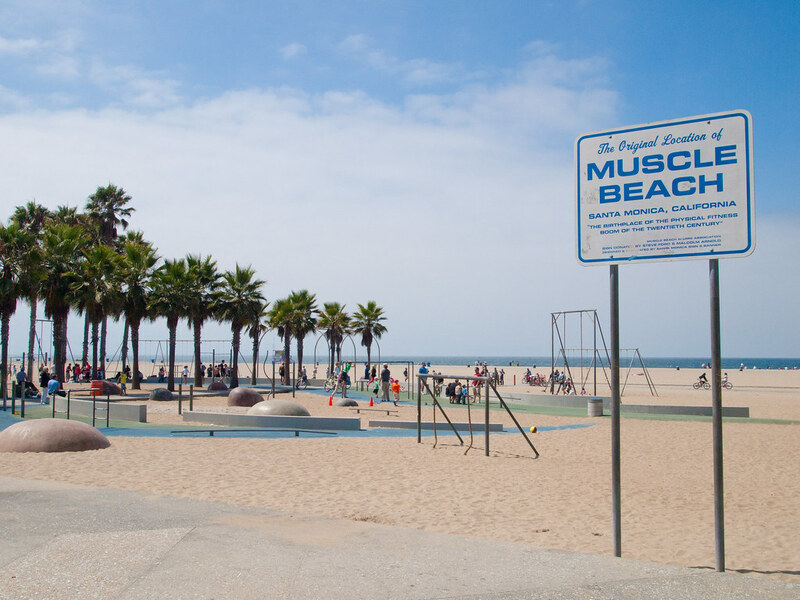 Muscle Beach is the place to enjoy a stroll down one of the city’s liveliest promenades. For dinner, head for Abbot Kinney Boulevard, where Hal’s is a great local hangout – ask for the burger, even if it’s not listed on the menu. Downtown shouldn’t be missed by foodies, who will love the Grand Central food market, where you can eat as well as browse, while culture-lovers can enjoy concerts at Disney Hall or world-class exhibitions at the Museum of Contemporary Art. From here the road leads south to Anaheim and Disneyland or north-east to Pasadena, a beautiful town of arts and crafts houses with its own museums, charming little restaurants and elegant leafy boulevards for strolling.